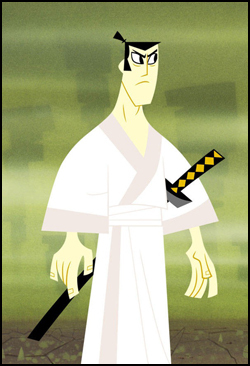 Samurai Jack is an animated series that ran on Cartoon Network from 2001 to 2004. Jack is a soft spoken, man of action that battles his nemesis Aku, throughout many eras. I was and am a fan. Yes. I’m a geek. But before you pass judgment it’s important to remember; no one is cool. My friend Rachel taught me this years ago at a Soundgarden concert at Red Rocks. We were looking out on a very eclectic crowd; the most varied I had ever seen. (When I started going to concerts you either fit the profile of the average attendee or you didn’t go. Metal = Metal Head, Punk = Punker, etc. This concert had every flavor of biped I could imagine.) After scanning the crowd, overwhelmed by the diversity, she calmly stated; “No one is cool. No one.” From that point on, I openly admitted what I liked, even if it wasn’t cool. The subject needs to be centered on the screen – For those of us that appreciate French films (I’ve seen five! ), we understand that the French like to put the characters at the edge of the screen to provide a sense of spatial volume for the shot. This does not work on mobile. Go big and for the center! Heavy contrast – Details are hard to see on the small screen, but you need to communicate the message. Contrast is an great way to do this. (Think black and white.Maybe Sin City.) This also helps if they’re watching the action in a well lit area. Texture can work – There is a lot of texture in Samurai Jack and it works because it covers most of the screen. It actually makes me think of some of the wall papers for the device and that may be why it works. Go bold! – Just as heavy contrast works, bold colors work. Don’t make everything a muted shade of subfusc (thanks Todd!). Think Smashburger’s brand. Leave out the details – This goes hand in hand with heavy contrast but it’s important to remove details. Think contemporary architecture when shooting the video. Do they have a piano with 100 family photos on top? It would be better if there were two. They just can’t be seen on the screen. I recommend that anyone wanting to embrace their inner (and outer) geek, go and download one (or many) of the Samurai Jack Episodes. They’re amazing. Below is a video of Genndy Tartakovsky and his team talking about making the show. Enjoy!